Sporting Events in or near Upington, Green Kalahari in the Northern Cape, South Africa. The Orange River originates from the Lesotho highlands up in the Drakensberg Mountains and meanders through South Africa and the amazing Richtersveld Desert Reserve before it joins the icy Atlantic Ocean. The race lulls the competitors with its mostly easy sections and sudden, difficult rapids. The first Orange Descent race was held on October 3 and 4, 1987 from Hopetown to the confluence of the Orange and Vaal Rivers at Bucklands, outside Douglas. It was the first major race that was held by the newly established Free State Canoe Union and the Bloemfontein Canoe and Triathlon Club. Freestaters had tripped the Orange in April 1987 and two small races from Hopetown to the farm Slypsteen were born. 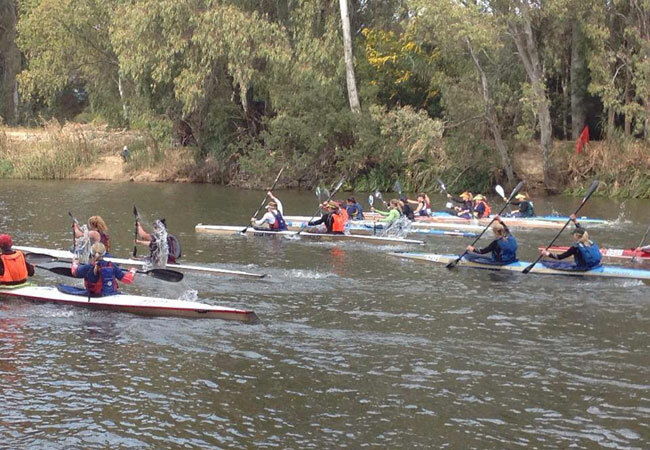 The then Transvaal Canoe Union also held, for a few years, a race known as the Hopetown Hump over the same course.